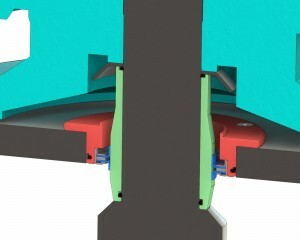 The dynamic seal of an agitator is located on the shaft feed-through into the tank. Different seal systems are available depending on the operating conditions in the tank (pressure and temperature). The systems most commonly used are: oil seal, V-ring seal, single mechanical seal (dry or lubricated), double mechanical seal (with liquid or nitrogen counter-pressure), hydraulic seal, stuffing box with packing.